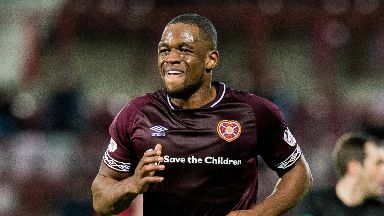 Uche Ikpeazu was the catalyst as Hearts delivered a three goal second half display to defeat Inverness Caledonian Thistle. With the sides tied at 0-0 after 45 minutes the English striker broke the deadlock at Hampden Park minutes after the re-start, to set the foundations for a comfortable victory that will see the capital men return to Glasgow's south side for the Scottish Cup final on the 26th of May. Craig Levein made one change from the side that lost to Hibernian at Tynecastle. Ikpeazu and Peter Haring both recovered from injury to start, Irish striker Aidan Keena replaced Sean Clare up front. Charlie Trafford returned from suspension for Inverness in place of Nathan Austin, while John Robertson brought back Brad McKay in place of Kevin McHattie. It was the Highlanders who started brighter, and registered the first effort on goal when Tom Walsh's cross was headed over the bar by Jordan White. Hearts grew into the game and put the Caley Thistle goal under pressure on the quarter hour with efforts from Jake Mulraney and Michael Smith. 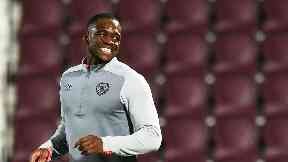 Mulraney then flashed a cross into the six yard box that evaded Ikpeazu, with Carl Tremarco able to clear. Hearts forced a succession of corners but were unable to trouble Mark Ridgers in goal until a snatched Ikpeazu effort was safely covered by the goalkeeper on the 27th minute. The Edinburgh side continued their ploy of bombarding the area with crosses from both flanks but found a blue and red wall of defenders barring the way to the opening goal. Referee Don Robertson blew for half time for the score goalless, and neither team could could claim to any dominance at the turnaround. After 45 minutes with little for the keepers to do Olly Lee quickly tested Ridgers within seconds of the re-start, forcing the Inverness number one to tip a 25 yard drive over the bar. Keena was next to shoot from range, straight down the throat of Ridgers, as Hearts looked to fly out the blocks. It only delayed the breakthrough though as Lee's short corner to Mulraney saw the Irish winger fizz a low ball into the six yard box and Ikpeazu slammed home the rebound from close range. 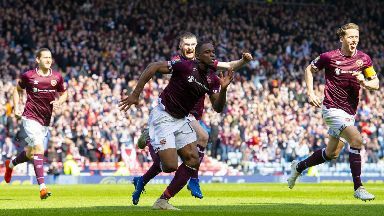 The Englishman celebrated with the Hearts supporters in the south stand as maroon frustrations were lifted just four minutes into the second period. Hearts almost gifted the Scottish Championship men a way back in to the contest in the 57th minute as a slack Berra pass led to a free kick awarded on the edge of the box. Joe Chalmers stepped up and whipped a left footed strike that was destined for the top corner until Zdenek Zlamal pushed it on to the crossbar and away to safety. 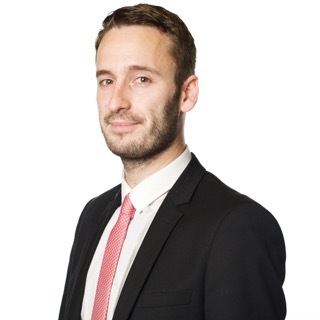 Hearts then had another let off when Jamie McCart was flagged offside on the edge of the box just as he curled a sublime effort into the back of the net. That proved to be a huge moment as Hearts doubled their lead just four minutes later. Lee's corner was not dealt with by Trafford and John Souttar volleyed just his second goal for the club into the roof of the net. Inverness kept going though and Chalmers forced another flying save from Zlamal with just over 20 minutes left in the contest. It was Levein's men that had the bit between their teeth now though and a penalty award when Ridgers felled Ikpeazu gave them the chance to wrap up the match. 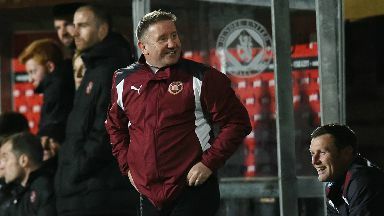 Substitute Sean Clare stepped up confidently to send the goalie the wrong way, and send Hearts into their first cup final for six years.